SMOOTH LEGS is a pad covered with superfine crystals that buff away unwanted hair, leaving your skin so soft and incredibly smooth. Works great on sensitive areas and also exfoliates as it removes the unwanted hair, leaving skin soft and smooth. SMOOTH LEGS is the easy, safe and painless way to remove unwanted hair. The unique Smooth legs pad is covered with superfine crystals that buff away unwanted hair. Smooth Away will leave your skin soft and smooth. Perfect for travel use! WHY YOU SHOULD USE SMOOOOTHLEGS TO REMOVE UNWANTED HAIR? 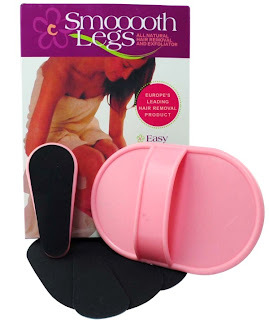 We use SmoooothLegs™ Micro-Crystal Pads to buff away unwanted hair and exfoliate at the same time. Each SmoooothLegs ™ Micro-Crystal Pad contains thousands of micro crystal particles that gently but effectively exfoliate the skin while removing hair at the same time. Fast and easy, with NO smelly & harmful chemicals, NO cuts, NO fuss and NO razor bumps! SmoooothLegs ™ leaves your skin smooth and comfortable. Gently exfoliate while removing hair: works by applying the product on your skin in gentle circular motions (clockwise first and then counter-clockwise). This buffs away unwanted hair and exfoliates dead skin cells at the same time revealing smooth healthy skin. No pain, no chemicals, no razor burn: Each flex-crystal pad is covered with tiny crystals that aid in the removal of hair through gentle circular motion that also exfoliates at the same time, leaving your skin ever-so-soft and fresh. 1. How long does a pad last? This will depend on the amount and coarseness of the hair. On average, one pad will last long enough to use on a woman's legs twice before needing to be replaced. 2. How long does the hair have to be? It is recommended that you use Smooth Legs on shorter hair, although it also works on regular and long hair. If the hair is on the longer side, first time trimming is recommended. 3. Will hair grow back thicker on my face? No the hair will not grow back thicker. After continued use, less hair will grow back and it will be thinner than previous hair.